This Thursday April 16th, 2015 Dover Street Market unleashes the NikeLab Air Jordan 1 Retro High OG x DSM (Obsidian/White). These will be available at the NikeLab Space at the Dover Street Market NY store and on the DSMNY E-SHOP. Nice all-obsidian blue patent leather upper with white outer sole. Perfect to wear with a suit. 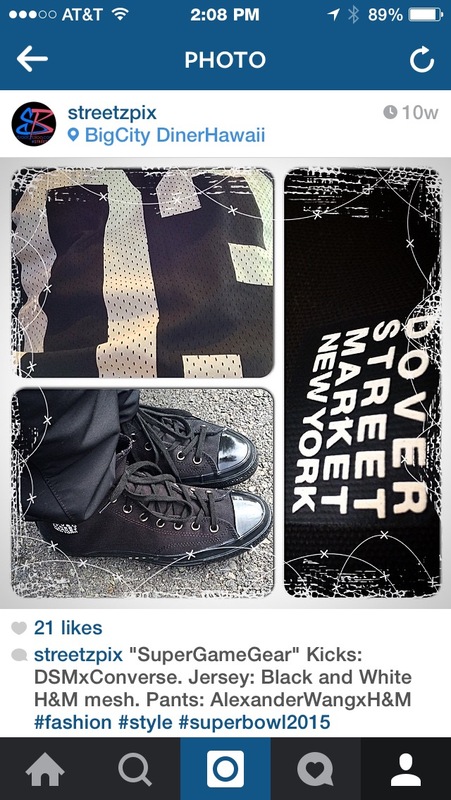 Although, It looks like the only mention of Dover Street Market is the DSM branding on the insoles. They also have a limited edition Jordan x DSM shirt and hat on sale this Thursday April 16th. You can sign up for an email for these 2 items also. Since these are Jordans, I suspect they will go quickly. When I was at DSMNY, I noticed most of the staff and some shoppers wearing a special pair of NikeLab kicks in a beige colorway. It was the first time I’d ever seen them. Since then I’ve only noticed them on a female Runway model. Look like they were pretty limited. The other shoe collab that I like is the Converse x DSM. I have a pair of these and they are the newer re-imagined Cons with an extra bounce in the sole. Very comfortable, you can really tell the difference. They are a pure black-Out colorway with a DSM design/logo in white. I’m pretty sure I’m the only one in Hawaii who has a pair of these. And some are still available on the DSMNY website. If you are in or go to NY, I would suggest visiting the store, it’s quite a fun place to visit, What do you think of the DSM collabs so far? Anyone know more about the beige pair? Thoughts on the new Obsidian Blue Patent J’s? Posted on April 14, 2015, in Cool, Jordans, KICKS and tagged Dover Street Market NY, Jordan 1 x DSM, Jordans, KIcks, style. Bookmark the permalink. Leave a comment.